Mid size jets are the perfect balance between smaller, light jets and more spacious long range aircrafts. Mid size jets can comfortably accommodate up to 10 passengers, but their diminutive size means that they are able to fly in and out of airports that larger commercial jets cannot access. Mid size jets make more destinations available to you with the added bonus of luxurious, comfortable travel for your entire party. A very popular choice for longer trips, our mid range jets have a range of approximately 2000 miles and travel at over 430 knots. That’s nearly 500 miles per hour. 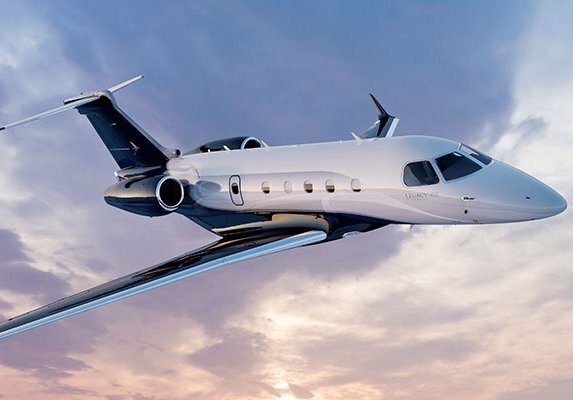 Mid size jets have increased luggage capacity, cabin space and galley facilities compared to light jets, and are therefore very popular for both private flights and business charter. If you’re interested in booking a mid size jet or have any questions about private and business jet charter, get in touch soon to ensure availability. Certified in June 2015, Cessna’s Citation Latitude is the latest model of the world’s best selling business jet. The Citation Latitude has an incredible range for its class and is therefore capable of flying intercontinentally. Its spacious interior was designed for business charters, with comfort in mind. Special Features: Fuel is stored in the wings of this aircraft to give it a competitive range. The Legacy 450 is Embraer’s flagship mid size jet. This is the fastest mid-size jet on the market, but it also has the largest cabin volume of its competitors. With a generous floor-plan and high level of efficiency, this is one of the Brazilian company’s best and most popular aircrafts for mid-range international flights. The Hawker 800XPR by Beechcraft is one of the most popular mid size business jets. It is perfect for smaller groups, with a very comfortable and spacious cabin that seats up to 8 passengers. The latest upgrades to this model have improved the aerodynamic performance and included more powerful engines, so it’s range and efficiency are impeccable. Special Features: Far cheaper to operate than the average mid size jet, and therefore more fuel efficient and better for the environment.